Soy & Palm Wax, which is environmentally safe. All our candle products are created without " Steric", U.V inhibitors or any other negative additives. Asthmatics are able to use our healing candles, if guidelines are followed. All our Soy & Palm products are blessed and infused with Reiki Energies. Feel the difference. Our overheads are low, and we pass on the savings to you. Our range includes...Containers of different sizes and design. 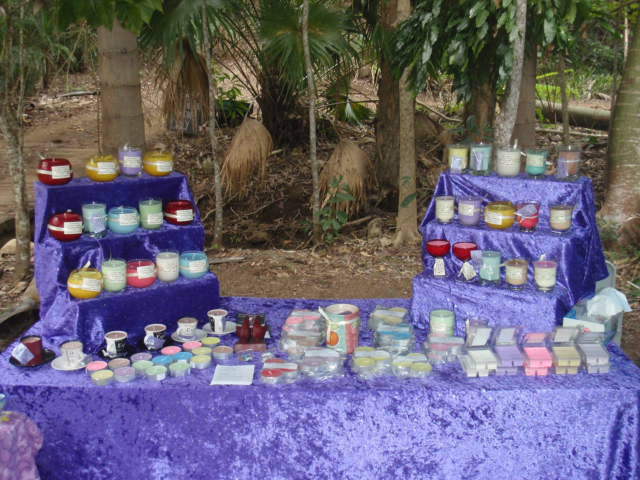 As well as various pillar palm wax candles. Our Melts are created with Soy wax. While T/Lights are filled with Palm Wax. (conditions apply). These healing candles can be purchased directly from us. Burn pillars & containers, for 1 hour, the first time you light your candle, rotating regularly.You will get a even burn,and not create a "Well" in the candle.Always trim the wick, and clean the inner surface of any container, of old wax, before lighting. This is to ensure your candle burns cleaner and longer. Put out the candle either with a candle snuffer, or simply wet your fingers to exhaust the flame. When you blow a Reiki Lights Candle out, you should always send a blessing to whoever is in your heart. Soy wax is 100% non toxic, and totally natural. Soy wax, due to a lower melting point,burns cooler.Soy & Palm wax lasts 25-65% longer. Soy wax cleans easily with soap and hot water. Soy & Palm wax releases fragrances naturally, faster and longer. Paraffin wax is derived from petroleum. burn completely. Paraffin must be blended with chemicals, to be able to release fragrances.